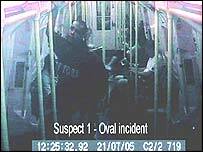 The bomb attacks on London have created an atmosphere of suspicion between Tube travellers. It's a crowded train in central London, and I'm sitting opposite an Asian man carrying what looks like a large laptop bag. Is it a coincidence that no one else is sitting near us? Is it an accident that he's pushed out his corporate ID card so that it's clearly visible over his jacket, hanging like the open page of a passport? Public transport can be a world of unspoken signals and gestures - but am I right in thinking that he looks self-conscious, sometimes burying his face in his arms as though asleep? When that woman getting into the carriage half-turned towards us and then moved away, was that a deliberate decision, or was it a random commuter choice? How would it feel to have someone literally turning their back on you? I change Tube lines and in the next train I'm sitting close to a woman wearing Islamic dress. But this time, all the seats are filled around her, and the atmosphere feels relaxed. What's going on in the thoughts of passengers? What judgements are they making? Following the London bomb attacks, there have been stories swapped all over the capital of people switching seats because of "suspicious" passengers. And targets of that suspicion have talked about their sense of frustration at the unsubtle attention of other travellers. In the rather unreal atmosphere of familiar places facing unfamiliar threats, people are taking note of actions and appearances they wouldn't usually see. Hundreds of e-mails sent in to the BBC News website show how, in the uneasy mood on public transport, we're thinking all kinds of unspoken thoughts. There are flickers of bigotry and thinly-disguised racism, but there are also convincingly understated descriptions of people's edginess - and examples of how it is changing people's behaviour, including a number who say they have stopped taking Tube trains. Marcus, who says his family are Greek-Cypriot, has devised a strategy to avoid "odd looks" on the Tube (which he attributes to his Mediterranean appearance). To make himself seem non-threatening, he now wears a Make Poverty History wristband and makes a point of reading the Economist. "Whilst this sounds ridiculous it does reassure people around me. Of course, the whole thing is ridiculous but these are ridiculous times we are living in," he writes. An Asian reader says fears about what people are thinking have stopped him carrying a rucksack. Being on the receiving end of such a hostile atmosphere has persuaded Leila, a white convert to Islam, to stop travelling by Tube altogether. "I sensed people's fear of me because of my Muslim dress. Sometimes people even preferred to stand rather than sit by me, leaving an empty seat next to me." Hindu and Sikh readers have also written to say they have experienced the same sense of rejection. This distrust between travellers is a phenomenon that feeds on itself, says psychologist Gary Fitzgibbon, from the north London-based consultancy, Fitzgibbon Associates. "You've got a strange effect here. Everybody's awareness of a threat is raised - and everyone is looking round suspiciously. So they're looking at each other - and what they observe is people looking at them suspiciously, which immediately raises their awareness that this person might be a threat. "You can get very anxious situations arising - and in the extreme it could lead to violence." Mr Fitzgibbon says fear is a natural response to a threat - but the prolonged media coverage, and the way that people continue to talk about the bombings, can generate a response that is greater than the actual threat that exists. And amid such fears, he says that people can tend to seek people more like themselves and to avoid those who are different. Such a reaction, already witnessed by people sending in e-mails, would threaten what a worried reader described as the capital's "multi-cultural mini-world". Before the start of July, as long as I can remember, there have been warnings every few minutes in stations to watch out for unattended luggage. There are signs on trains saying the same. The fact that each day now there are so many calls to the police about such abandonded items speaks volumes for how many unattended items people ignored before the first week in July. Its often a tense atmosphere using public transport and I certainly am thinking all the time about the people around me, judging, weighing them up in my mind as a potential threat! i certainly dont fit any particular stereotype of a would be suicide bomber but have still noticed peoples eyes on my back pack. I want to say to everyone who is asian or looks to be a posible threat that you should look around you and be aware that you are not the only ones who are under suspicion. I am very wary of all sorts of people now and make no appologies for it!! I think the author here has described the current situation perfectly. It is almost impossible not to look around you as get onto a train these days. I know I have done it and sat there worried. The only worry you have is what you'd do if you think someone does look suspicious. You won't want to challenge them but you won't want to move away for fear of inciting panic and insulting to the person who will almost certainly turn out to be innocent of nothing more than going to work with their gym kit. This all does seem incredibly surreal however it's not really surprising. People I talk to are saying they feel we are in a 'war zone' and personal safety is compromised. I would hope it is common sense to take actions not to look suspicious. I do not carry a rucksack in London now, I use a sports bag which, though inconvenient is less threatening. I am a white Englishman (though can look mediterranean with some suntan) but I accept things must be different now. Yes, I am worried, though I won't give in to my fears and will continue to travel as before. You'll have to excuse me for being wary of my fellow passangers especially young muslim males carrying backpacks. Next you'll be telling me I'm infringing their human rights. I have a basic human right to travel to work without a young muslim male carrying a backpack blowing the train up. Four have done it already. At least four more tried unsuccessfully. Do I feel guilty about offending someone? Not in the slightest. I love living in London and one of the things I enjoy the most is the ¿International City¿ aspect. I travel on the Northern Line to work everyday and the mood has changed for the worse. I really feel sorry for my fellow commuters that people would regard as of ¿Muslim appearance¿. But I think considering the loss of life so far it is totally understandable the people are a lot more aware of the people around them. Sean Coughlin has summarised my feelings entirely. I travel overground into London daily and then only travel four stops on the tube. I resolved on Sunday to walk these instead. However it was raining on Monday so I took the easy, or more accurately lazy option and took the Underground. I have travelled on the tube for twenty years and in all that time have NEVER experienced the fear and mistrust I did on Monday. I found myself reading the same sentence of my book throughout the journey, looking up to give furtive glances to my fellow passengers. They were doing the same themselves. I focussed on a chap who was wearing a padded jacket and putting his hand into his inside pocket. Honestly, I was absolutely fixated. The poor man was only fiddling with his ipod. The guilt I felt about judging someone so quickly - and let's be frank - on the grounds of their ethnic group made me feel quite ashamed. After all, the suicide bombers, including the ones who got away, looked like ordinary young men - even down to the New York embossed hooded top one of them was wearing. Paranoia as opposed to well balanced vigilance is a terrorist's key weapon. I've decided that if I can't travel the tube without looking at my fellow passengers in fear then I shouldn't, quite frankly, be travelling at all. Thanks to the author for bringing up the subject. However, in my opinion many people are trying to justify this kind of behaviour by 'reasonable fear'. Reasonable as it might be, it is no reason for racism. Not sitting next to someone on the train is nothing but racism. It is not new, I think. People who know what Asian culture is, what Islam is, the difference between Islam and Hinduism, who have Asian friends, who truly have never been racist will not behave like that. Those who will not seat next to Asains these days have always been racist and only need a 'justifiable' reason to show it. Shame on them. 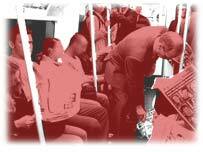 Fear is no good reason to make London tube a racially segregated form of transport! The way London commuters now feel is to be expected, but this is just the start of what¿s to come. These London bombs will be a part of history that will stand out as the date when a race split across Europe began. It¿s a horrible world we are standing on the edge of. That is why it is called terrorism the threat or use of violence, often against the civilian population, to achieve political or social ends with the aim of sowing fear and confusion. I live in Bristol but use the tubes when I go to London for meetings. Last wednesday I noticed a very odd atmosphere, tense with everyone looking around at everyone else, especially each others bags. Paradoxically people were a lot more polite than normal, with strangers actually talking to each other, something I've never experienced in London before. I've read with interest the comments refered to in Coughlan's piece. As an Asian man who has lived in London for the last eight years it seems absurd that these terror attacks have awoken Asian people as to how theyre perceived by other Londoners. My regulary bus journey into central London start with two empty decks, as the journey continues the seats around me quickly fill up with two people squeezed in per bench. Quite often I have a spare seat next to me, unless there is almost no room elsewhere for passengers to sit. Now, why is this? ...as a white comuter you should ask yourself do you always opt to sit next to another white person - chances are, you've not changed your behaviour after the bombing because you always did sit next to another white person anyway. We have to face up to the fact that religions are just behavioural systems; no different from cults, they exist only because of their perpetuation mechanisms. Sadly, contempt and stigma seem to be as effective as anything - whatever the results for life in the UK. It's natural people are going to be suspicous, nervous, anxious and aware on the tubes. The Police are asking people to be extra vigliant. It saddens me to hear that innocent, decent muslims and people of a different colour are having to leave their bags at home, show their ID badge or read the Economist BUT there are people out there wanting to kill us. This is an extreme situation. Until this moves away, as I am hoping beyond hope that it does, I think patience and understanding is necessary from all people in the capital. Now the general public has been introduced to the plight of the black man. I am a chemistry PhD student, a research and teaching assistant but that does not seem to be enough to make others feel comfortable. I too make my own declarations: doing work on my computer, grading papers or reading some chemical journal with a molecule in full view, but I still see some women clutch their purses a little more tightly or some men making sure their wallets are still there as I pass. To survive, you have to train yourself to just let it go. Perhaps when the fear subsides and the london public returns to a fair sense of normalcy, we will learn the more appropriate of the two lesson here: Dont judge. I too am responding in a somewhat irrational way to the threat of bombings. Just the other day I was at Camberwell Green, waiting for a bus, and I had all sorts of disturbing thoughts running through my head. Instead of getting on any one of 3 buses, I decided to wait for a bus which starts its route at Camberwell Green, as it would be empty, and the driver would have just done his security check. Then as I was about to get on an asian man carrying a large holdall boarded the bus. I was terrified, there were lots of passengers, and that in itself had unnerved me. I got on and stayed as far from the man as I could, and kept stealing glances at him. All the while my mind was working overtime as I tried to assure myself of my safety. Luckily my journey was a short one, and as I disembarked, I half expected to see the bus explode as I walked away, or to hear about it later that evening on the news - when I heard nothing I felt incredibly guilty that I had naturally assumed that the "innocent" asian man was a terrorist. We all need to be extrememly careful of how we regard others in light of these terrible events, or our multicultural society (which we should be proud of)will turn into a society blighted by racist crimes/divisions. I got onto the busy carriage of a train on Saturday. There was an empty seat which everyone getting onto the carriage walked past. The seat to the left of the empty one was taken up by a man of African origin and he had a large holdall by his feet. I need say no more. So, I deliberately asked in a clear voice if the seat was taken (as if I needed to ask!) he smiled said help yourself and so I sat down. I understand that people are on edge but let's not allow the terrorists to drive a wedge between the different races and cultures that make up a country and home which everyone should be proud of. Whether you're black, brown, yellow, white or green, with a rucksack or a bunch of flowers, I'll sit next to you! The events have indeed affected us. Today I saw an Asian man running away from a bus: everyone tuned and stared at him until he turned a corner... to catch another bus. I think we were not vigilant enough before. We should just find the right balance between paranoia and indifference. When they look at me what do they see? A suspect terrorist? It's amazing that by just wearing a cloth on my head it can change a simple mans view of myself. I do not blame him. I feel for him as he thinks twice about getting on the same carriage as me. I feel for the woman over there who is watching my every move - from increasing the volume on my ipod to scratching my arm. I feel for those passengers who are so scared by me reaching into my handbag searching for my little blue extras (chewing gum).... I feel for them all. I won't change, I won't be accepted. Apologies. I was on a bus in Scotland this weekend with a gaggle of Spanish teenagers. An elderly sikh man with a long beard and turban got on the bus and they all stared at him. They were speaking in Spanish, but they muttered "Osama Bin Laden", at which point everyone turned to stare at this poor man who was just (trying to) mind his own business. I was shocked that these teenagers felt that this was an acceptable way to behave. Let us be more aware of this ignorant behaviour, and if we see it happening we should all speak up to defend the innocent. Being an Asian, I have noticed many people looking at me curiously/suspiciously while on trains and buses. I try to ignore those staring by solving SuDoKu puzzles but does not always help. Also, I have swapped my slightly bigger bag for a softer smaller one because of the 'rucksack phenomenon'. Hopefully time will make things get back to normal. I have travelled on the underground a couple of times since the bombings, and have experienced my fellow citizens react in a variety of ways. Most people have been subtle, some are rude, however, people have also moved closer towards me to show that thet too 'are not afraid'. All this is understandable, the last two weeks have been stressful for commuters. The question I am asking is how long will this last? The treat is large at the moment because the bombers are still on the run. But what will reactions be this time next year? My hope is that we will behave in a proportional manner. We must always remeber that the bombers main aim is to divide, they will have done a good job if we become forever suspicious of each other. As an avid people-watcher I've witnessed train commuters' personas change over the past couple of weeks. Even here on the train into Newcastle many miles from recent events in London. Instead of the usual drab and emotionless exteriors of people on the way to the daily grind, commuters seem wide-eyed and wary. Not outwardly so, but just veiled glances and suspicious thoughts. The impact of terrorism is far and wide. The traditionally safe notion of not talking to strangers, and the Londoners¿ habit of remaining silent and avoiding eye contact on the tube (to avoid provocation among other reasons) now play against us. It is now an unhappy truism that anyone darker than the average Celt is likely to be viewed with a degree of suspicion, especially if wearing a rucksack or heavy clothing. I suggest we start saying good morning to each other; comment on the weather. An impending suicide bomber would be edgy and nervous, and not in the least bit talkative. Then¿s the time to get suspicious. 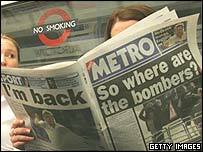 There is definitely an increase in tension and suspicion amongst users of public transport since the bombings. I carry a small back-pack with my gym kit each morning and, despite being Scottish and distinctly fair in complexion, I have attracted suspicious glances from fellow passengers. If I am being viewed with suspicion, goodness knows what it must be like for people of middle-eastern or asian appearance - a whole lot worse, I imagine. I'm ashamed to admit that, despite myself, I have found myself checking out fellow passengers, particularly those of asian appearance, if they are carrying rucksacks. However, I have now realised that to do this allows the terrorists to win - they want to create fear, suspicion and ethnic hatred. We cannot allow them to do this. Do not view every backpacked passenger as a potential terrorist and refuse to sit near them. You've got a far greater chance of being killed by a passing car - does this mean you are going to stop crossing the street?